This season, the highlight of the White House Holiday décor began in the small town of Enfield, Connecticut -- at the offices of LEGO Systems. There, a team of seven LEGO Master Builders spent 500 hours designing and building custom LEGO gingerbread house decorations to adorn the two trees in the White House State Dining Room. They constructed 56 in all, each unique to the attributes of each U.S. state and territory. The South Dakota gingerbread house, for example, has a LEGO Mount Rushmore protruding from its roof, while the Maryland one has a LEGO blue crab on its front lawn. Below an immense portrait of Abraham Lincoln, even more LEGOs grace the room’s mantle. An 18 foot long “paper chain” is draped between two LEGO “gingerfriends,” built from 4,900 LEGOs. 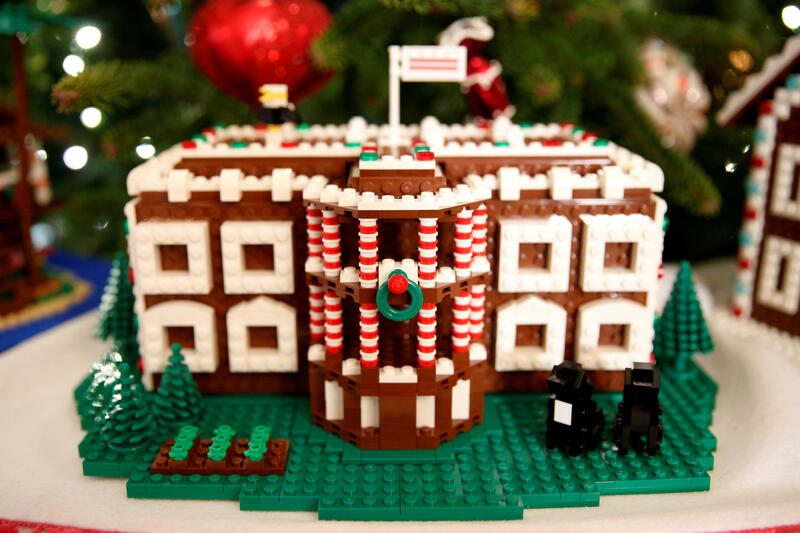 Over 68,000 people will see the LEGOs when they visit the White House this holiday season. First Lady Michelle Obama said half a million guests have visited over the holidays during President Obama’s eight years in office. Tuesday she reflected on welcoming Americans of all backgrounds to the White House over the years. “As we celebrate my family’s last holiday season in the White House I’m thinking back to when we first came here to Washington, and we promised to open up this house to as many people from as many backgrounds as possible. And we truly wanted to make the White House the people’s house, particularly during the holiday seasons. And over the past eight years through the seasons we worked hard to achieve that goal,” she said. This year’s décor also includes the traditions of years past. In the Blue Room is this year’s traditional White House Christmas Tree—a 19-foot Douglas Fir from Pennsylvania. The tree is decorated with ornaments donated by Americans across the country and those serving overseas. A garland with the preamble to the U.S Constitution on it streams through the tree’s branches. The tree was presented to Mrs. Obama and her nephews Austin and Aaron Robinson on Friday by Dave and Mary Vander Velden of Oconto, Wisconsin. The Vander Veldens were the 2016 winners of the National Christmas Tree Association’s National Tree Contest. Nearby, on display in the State Dining Room, sits another standby of White House Holiday décor. This year’s White House Gingerbread House is made of 150 pounds of gingerbread on the inside, 100 pounds of bread dough on the outside, 20 pounds of gum paste, 20 pounds of icing and 20 pounds of sculpted sugar pieces. Miniature confectionary versions of the First Dogs, Bo and Sunny, are perched in front of the replica’s front steps.